We are officially three months out (actually more like 2.5 months out) from our long distance move to California! Time is flying by and the holiday season, sick kids, holiday events, and present shopping isn't helping our move to-do list any... If you have been following our moving series, you know that we are pretty much long distance move exerts at this point. 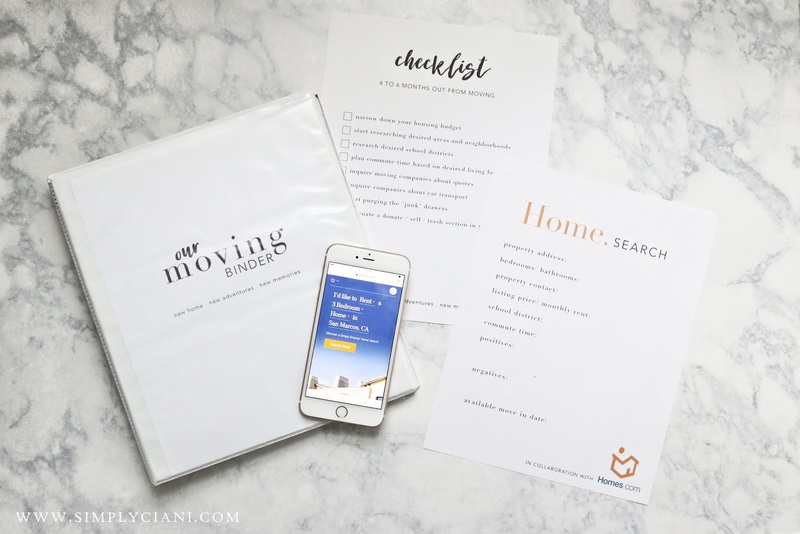 In this update I want to share a little more about where we are at with our home search using Homes.com, and other tips I have come to find helpful after making my own moving mistakes over the years. 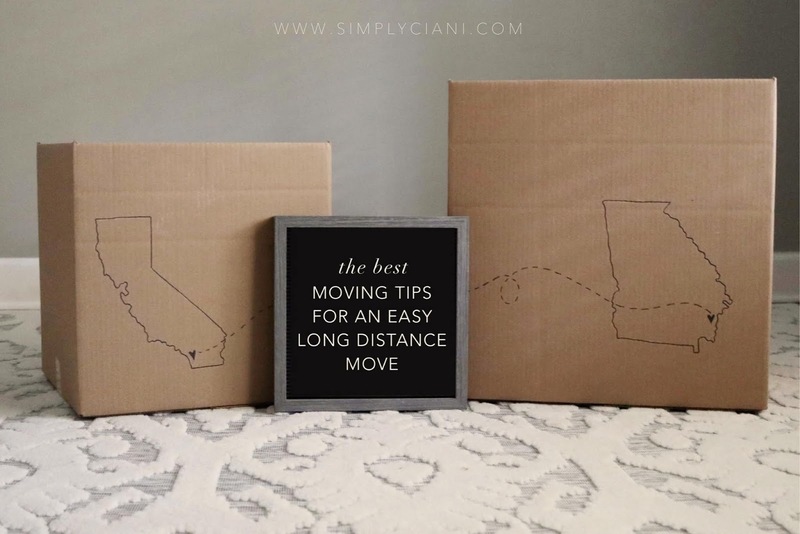 All of this info will help you to make long distance moving a breeze and (almost) stress-free! Before I ever start packing a box, I like to start each move off with a fresh start. This means selling all of the "junk". Being 3 months (or less) out from a long distance move is the perfect time to start de-cluttering and really planning what you will be taking with you onto your new home. I first start by designating an area of my home where I can begin placing all of the items I need to sell. This allows me to keep track and sort like items such as home decor, clothing, and household items. I can easily take items from that area, photograph them for online groups/sites and place them back. As these items sell, I can put sold tags or sticky notes on them and wait for their new owners to come pick them up. Being that our home is small, I keep all of our "sell" items currently in our front entry. If you are a neat freak, like myself, the clutter will likely drive you crazy but just remember, it's only temporary. No need for a garage sale, selling your home items online now is extremely easy and convenient and I have compiled a few tips to get you top dollar! Photography is important - I cannot stress this enough. I have been selling not only my own household items online for years but also furniture I have painted to sell, along with furniture we have built. When selling online, all your potential buyer has to go off of is the photo. Take high resolution photos if you have a camera to do so. If not, cell phone quality is perfectly fine too. Take crisp clear bright images. Photograph your item using natural light at the brightest time of day in your home. If your images are still dark, you can always edit them in an app. One of my favorites is PicTapGo or VSCO, just adjust the brightness and sharpness and you are set. Stage your decor - When photographing, stage your decor to show your potential buyer how that item can be used in their own home. Think of your favorite home decor catalog, you want to buy the items in that catalog because you can vision it in your own home. Pick a backdrop - If staging items just isn't your thing our sounds like too much work, photographing your items against the same background is an easy way to have all of your images cohesive and makes the subject the focus. Pick a well lit area of your home, against a plain wall (preferably neutral), or use a roll of white paper and tape to a wall. Photograph each of your items individually. Posting your items on Facebook - Facebook is one of my favorite places to sell for many reasons. It is easy to upload many images at once into local re-sale groups, you can also post those items into FB marketplace at the same time with just one click, you can share personal items for sale with friends on your own profile by making a photo album, plus you can create a private FB event for your friends to come shop your home/ garage sale. Write clear descriptions and add measurements - Make things easier on yourself than trying to answer a ton of the same questions from potential buyers. Write clear and precise descriptions of your items, the condition of your items, brand, along with measurements. Also note if the item is from a pet free/ smoke free home or not. Utilize clothing resale sites - Have clothes that are in great condition? One of my favorite sites to sell both mine and my children's clothes on is ThreadUp. It saves me the hassle of having to photograph the items myself and leaves the selling to them. Then once my items sell, the money from my sales is free for me to use on their site to buy new to me clothing or I can have the money transferred to me. There are a ton of these types of sites out there, and many for higher end designer clothing and accessories. Just do your research before selling, but many of them are great! Sorting through the toys can be overwhelming and one huge task that honestly no parent wants to do. All of the little tiny toy pieces, the fights with the kids of what to actually get rid of, and the begging just to keep that one toy they all the sudden discovered in the trash bag that they haven't played with in almost a year. Being that I have two children in 2 different stages, I have learned a few tricks along the way to getting them involved. My almost 7 year old is my hoarder. She wants to keep every little McDonald's toy to every tiny rock and crystal. In the past year or so we have created a new rule in our home, that no new toys are bought unless one old one is sold. And she can only use the money from what is sold to buy something new. More often than not that means selling 2-3 things just to get 1 new one. It also acts as a great incentive for her to really analyze what means the most to her. She now gets excited with every toy clean out, and when it came to selling this time around, she jumped right in and wanted to even help me come up with prices of what to sell the old toys for. As for my little one, luckily she isn't old enough to care yet. With her, we have always kept toys to a minimum since she was born, being that most of her toys are from her big sister. We like to keep toys that will keep her attention for a few years rather buying baby toys, toddler toys, and so on... Our favorites are the play kitchen and play food, interactive stuffed animals, and building blocks. 3 months out, you are not quite ready to pack up the entire house yet, but you are ready to get a head start. Begin by packing the items you know that you will not need within the next 3 months. For example: holiday or seasonal decor, childhood keepsakes, out of season clothing, books, any decor not in use, dvds/cds, photographs and albums. Once you have these items packed up and boxed, you will be surprised at the space it will free up. Currently, I have been stacking all of our packed boxes in the garage and sorted by area in the home they will be going to when we move into the new house. Now that you have gone through the items you plan to sell and have begun packing what you plan to keep, it's time to take out the trash! We all have them, the junk drawers, boxes, bins, baskets, and closets... The junk always seems to pile up and hide away no matter how hard we try to keep things organized. My rule when preparing to move, is to go through one drawer a day/ week (whatever your schedule allows). I like to start in the bathrooms. First getting rid of all old and expired shampoos, soaps and makeup. I am afraid to say, I recently found makeup I have been hoarding from my early 20's, nearly 10 years ago! Yep, apparently no matter how many times I move, there is still trash that travels with me somehow... Once the bathrooms are all cleared, I head onto the kitchen and the drawers that just seem to accumulate everything. Throwing away old receipts, gum wrappers, broken pencils, and all of that junk mail. Little by little, I make my way through every drawer, cabinet and closet before we ever even get close to move week. This makes me feel like I can handle the mess without being overwhelmed, stressed and frantically throwing our trash into a box at the last minute. You might ask, "How are things going with the house hunt?" Well... were still hunting. We have now narrowed down to a specific neighborhood in north county San Diego called San Marcos. We feel it has the best school district for our price range, a great family community and close to my family. We are on the search for at least a 3 bedroom/ 2 bathroom single family home or town home. So far, we are still a little bit of a ways out timeline wise to put in an application since we will be renting, most listings are wanting a move in date of 30 days or less. I have saved a handful of my favorites on Homes.com and will be watching them closely over the next month to see if they might still be available. When renting, or applying for a rental from a long distance, it does limit you. You are on a timeline of when you can move in. If the home is currently vacant, the landlord or property management company likely will rent out to the first qualified applicant who can move in as soon as possible. Being tied down to a date until you will be in town, can result in losing out on something you may love. When moving from California to Georgia, this was the exact problem we ran into and in the process I learned a few things that can set you apart as a renter when you might face some factors that go against the norm. There are many reasons that you as a renter might find it difficult to compete with other applicants. Maybe you have a larger pet, maybe your credit score isn't the absolute greatest, maybe you find yourself in a new job and don't have a steady income history, maybe you are a long distance mover like us or maybe you are on a tight time crunch and need a new rental asap. Whatever the reason, the rental market is competitive enough, without having obstacles in place. To set yourself apart from just another application, you might consider writing up a personal "about me/ about our family" letter. We did this with our last long distance move. We were on a tight time crunch to find a home, in a market where not many rentals were available and to be honest our credit was not the best. We were applying for a single family home that already had 3 other applications in on it. Along with our application, I sent along a letter, introducing the homeowner to our family. Telling them why we saw their home as our ideal fit, explaining our shortcomings with our credit and situation of why we couldn't move in until the end of the month. Although our credit wasn't the best, I made sure to add in pay stubs to show my husband's proof of income. Granted, we didn't have any pets, but it seemed as if every other obstacle was stacked against us. At the end of our letter, I included an attached photo of our family and the current home we lived in so the homeowner could see how we took care of the current rental we were in. As you are reading this, here on my blog, you obviously know I am a blogger. So of course I had a handful of staged photos of my decor. But I don't want that to discourage you. You don't have to be a home decor blogger, or interior decorator to show the beautiful home you have created. Take a day, clean your home well and snap a few photos of the main areas of your current home. You would be surprised at how including these photos in a letter will set you apart. To take it one step further, if you can get a letter of recommendation from your current landlord/ property management company include that as well! Lastly, if you are facing a lower credit score, you might have to offer a little more than you are wanting to, to get into your desired home. This may mean signing a longer lease. In our last home, we knew we would be in that home for at least 3 years, so we felt comfortable offering to sign a 3 year lease up front to make up for our lower credit score. If signing a longer lease is too much of a commitment, you might have to put down a larger deposit. Not saying that these things you need to offer right up front, but if your application is turned away, you might want to go back offering some of these things and see what they say back. If all of this seems like a lot to take in... JUST BREATHE. Moving is overwhelming, and I myself am for sure feeling the effects lately. But I promise you, it will all get done. It will all fall into place. Just take a deep breath. Go through one junk drawer at a time, fill one for sale bag at a time and pack one box at a time. Little by little you will get there. I promise. and visit Homes.com for all of your home search needs from renting to buying. Just wanted to thank you from TSC and intorduce these reliable movers moving companies Toronto, Highly recommend hiring them. They were informative on process, timing, very courteous, and exercised care with with our possessions... and above all very patient with the questions that came their way.